In response to Viewfromtheside’s weekly prompt. makes treading earth light, fantastic. Today is the first official day of Fall. And a stunning day it is. This September has been glorious. Fine weather, beautiful skies, bountiful produce and gardens still flourishing. Bon Accord put on an event this weekend called the Summer Skies Equinox. A 30 hour marathon of events and activities all associated with the night sky began on Friday evening and will culminate at just past midnight on the 22nd. This morning, Heather and I got up and went for an early morning walk — 6:15-ish — not something we usually do on a weekend and ended it with a stop for a cup of tea. Well, I had coffee (thank God they thought of us coffee drinkers!). The ladies from Vintage Petals tea shop in Morinville set up a little tea station outside the Golden Jems building and a handful of us early risers stood about enjoying a steaming cup while we chatted and enjoyed the dawn. The morning sky has been stunning these past few days. Clear, un-marred by clouds and a gorgeous array of colour from cerulean blue on the horizon to darkest indigo high overhead. 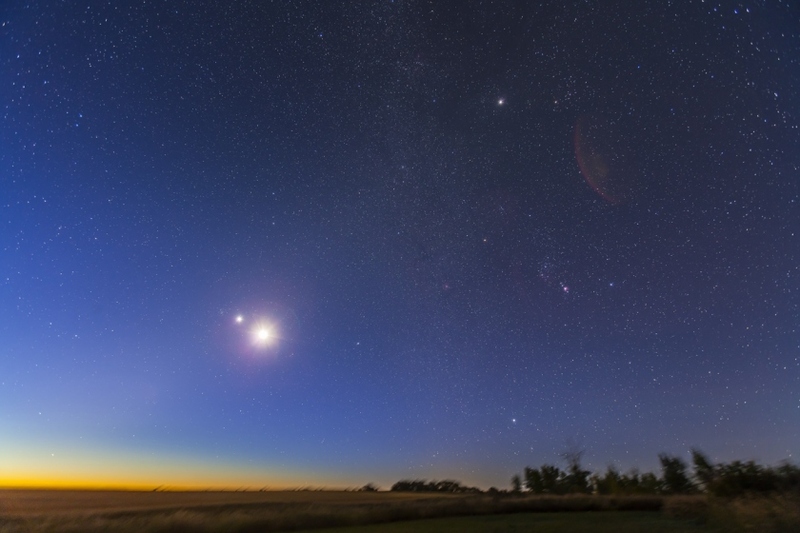 Venus and Jupiter have been twin lights shining a bright greeting in the Eastern sky each morning, and we were lucky enough to see them in perfect alignment with the moon one morning. Had I been up to it last night I’d have gone out to check the night sky through some amazingly powerful telescopes set up by local astronomers. Heather and her husband did and she says they got some fantastic views of the planets and even a couple of nebulas. But, I was satisfied with my walk this morning, the clear, crisp morning air, the sky overhead, the town still mostly asleep and our footsteps crunching along the gravel road as we made our way towards the warmth of tea and community. This is a picture of the sky as I see it on my walks. Not my photo, but it is in Alberta. Patricks photographs are amazing. Please check him out. I’m so glad he stopped in to check out my blog! I would have really missed something if he hadn’t. Sounds like I’m writing a philosophical thesis, doesn’t it? But, I’m not. It’s just a few thoughts on a subject that bugs me — and millions of others, I suppose — the dreaded ‘c’ word, clutter. My husband and I have fought many battles over what I call clutter and he calls history. It’s a collection of stuff that we’ve accumulated over our 35 years together. Some of it’s good stuff, most of it is not. There’s a lot of stuff we inherited from his parents and that is a particularly touchy area. There is all the stuff of Landon’s, our son, that I’ve kept. Our home is packed with bits and pieces of holidays, photographs, art (the kind we could afford), old toys, china teacups, pottery, glass, miniatures, cigar and cigarette cases, rocks, kitsch, junk. Tim’s idea is that our clutter is a form of history. And I’m beginning to see his side. My idea is that it is a lot of useless stuff that needs to be gone through and gotten rid of in case we die in a fiery car wreck and our son gets stuck with the onerous job of dealing with it all. I’ve tried pointing this out to Tim numerous times, because it is what he and his brothers had to do after their parents died (not in a fiery car wreck, though). He says that although it was tough he was glad they did it. It brought back a lot of memories of their lives as boys with their parents. Landon won’t have that because he is an only child, and so, I guess, my reasoning is to protect him from the loneliness of such a task. But, who knows? Perhaps he would include his children and share with them some of the memories he had of growing up with us. It’s impossible to know. In thinking about my need to clean and purge I’ve come to the realization that it was born from the influence of magazines and television shows. I love to pick up home decor magazines and leaf through them oohing and aahing over the gorgeous rooms and sparkling bare countertops. I eye photos of polished wooden tables bare except for lavish bouquets of designer blossoms, and bedrooms with vast expanses of floors bare of anything save hand-woven, rough-spun cotton throw rugs and I swoon with desire. I read about ideas for taking treasured mementos and turning them into space-saving crafts — like making a collage of family photos on a wooden tea-tray, or decoupaging your children’s art onto a lamp base, or making mobiles out of old silver place settings handed down from Grandma or old Aunt Dottie. These are fabulous ideas, and I tell myself that they would work, but then, I mention them to Tim and he gets a horrified look in his eyes. You want to destroy our pictures? And then, I get to thinking: what happens if the project doesn’t turn out as nice as it should. (This happens, trust me.) Tim’s suggestion is to take the pictures, make copies and use them. So, I’m then left with the prospect of still having the original photo clutter and a nice tea-tray that I won’t use, or having the original photo clutter and a tea-tray that gets shunted into a closet somewhere. Which leads to my next big fear about clutter: that we become hoarders. I watch the television show, Hoarders. It scares the bejeezus out of me. It’s disturbing to see how out of control people can become when it comes to their stuff. Could that happen to us, I wonder. Already our basement is like a maze (even without the couple dozen boxes of my son’s family belongings, stored while they wait to move into their new home). We have shelving units crammed to the rafters with junk, piles of wood and coffee cans filled with nails, screws, bits of this and bits of that. Tim has at least a dozen different tool boxes and bags, none of which are full. His workbench is a complete disarray of everything that just gets plunked there. In the upstairs, just off our living room, is a closet where I keep my craft projects. A couple of years ago I went through it and got rid of a bunch of stuff — but it is still crammed with projects I haven’t touched in years. Beading, knitting, embroidery, calligraphy, painting, weaving, sewing, candle making — it’s all there in the dark, hidden beneath a dozen or so of our unworn coats. Every year I say I’m going to get rid of those coats, but every year I hang them back up thinking there might be a need for them. I do this with a heavy heart, knowing that there are plenty of people in our province who could use a nice warm, though slightly dated, coat come winter. Still, I place them back on the hangers and close the closet door. Out of sight. . .
. . .but not out of mind. No, never out of mind. Getting back to my slowly changing opinion about whether our stuff is history or junk. I get where Tim is coming from. Having a houseful of clutter is like having a houseful of interesting. Those rooms that I so adore, the ones devoid of clutter? Those would be boring after a while. Especially to children. With nothing to look at, touch or play with in such rooms, why would children even want to be in them. Our rooms, though filled with clutter, and completely lacking any sense of design or decorating taste, are interesting. When my grandkids come they always find something to ask about or to play with. And Tim and I both enjoy sharing little stories with them about whatever it is they hold in their hands. And, when we have visitors, people are always intrigued by some ‘thing’ we’ve got hanging around or sitting on a shelf. It often amazes me what people notice, but I’m always happy to share a story with them. And, so, that is why when I woke up this morning thinking with despair about having to dust my kitchen wall unit and the chore that it would be because there is so much junk in and on it, I remembered Tim holding Timothy up to the cupboard and taking out a small, painted metal horse that was part of a game he had when he was a little boy. And I remembered the look of delight on Timothy’s face as Tim placed it in his hand, and how he listened so carefully while Tim explained how he used to play with it. Someday, all of these things that have been a part of lives — the trivial, everyday bits and pieces — will be tiny reminders of who we were and that we were. They are, in a sense, part of our history. Still the question remains: How do I achieve balance between history and clutter? I’m going to leave it for a while; think about it while I dust and hold in my hands some of the past 35 years of my life.